Himmel auf Erden! Estero Beach und Tennis Club; Unsere Wohnung im 12. Stock bietet einen schönen Blick auf den Golf, die Bucht, den Yachthafen und den Golfplatz. Die Wohnung im 12. Stock bietet alle Aussicht auf den Golf und fantastische Sonnenuntergänge. Eine Veranda mit Blick auf 10 Hektar Palmen, Blumen und einem wunderschönen Brunnen. Direkter Zugang zu der 7-Meile Strand von strahlend weißen Sandstrand und den Golf und einer Flussmündung, wo Vögel füttern den ganzen Tag. Dolphins, Rosalöffler, Fischadler, Reiher und sind reichlich vorhanden. Einkaufsmöglichkeiten, Restaurants, Yachthafen und viele Wassersportarten sowie ein Kino, Lovers Key State Park, Museen. Für einen wirklich entspannenden Urlaub von etwas Sonne am Pool oder am Strand spazieren gehen. Estero Beach and Tennis Club sollte Ihr Ziel sein. Southwest Florida genießt eine der schönsten Jahr über Klima und bietet einen idealen Rückzugsort von den harten Winter im Yukon. Wir begrüßen Sie als unsere Gäste!Unsere weißen Sandstrände haben die Fantasie der Besucher von nah und fern erfasst. Boatin, Fischen und spektakuläre Lovers Key State Park machen diese Insel zu einem echten Erholungsplatz. Dazu kommt, dass Old Florida Charme, Restaurants mit frischen Meeresfrüchten aus dem Golf von Mexiko und einem Jahres Shrimp Festival, und es einen Strandurlaub Paradies. Nachtleben glänzt an der Nordspitze der Insel rund um Shopping-and-dining Ziel Times Square, und Sonnenuntergang zu beobachten, ist eine beliebte Freizeitbeschäftigung. Natursandstrände bieten eine Kulisse zum Entspannen, Lesen, Beschuss oder machen Burgen in den Sand. Einer der beliebtesten Strandaktivitäten an den Stränden von Fort Myers ist Beschuss. Finden Sie die besten Schalenproben früh am Morgen, bevor die Auswahl wieder vorbei. Shellers teilen den Strand mit Naturliebhaber, die Strände auf diesen vorgelagerten Inseln sind nur durch die Natur gepflegt, so Tierwelt wie zu Hause fühlt. Unser Strand bietet ruhiges Wasser und einfachen Zugang, die ideal für Familien ist. Wenn Sie für Spaß und Wassersport in Ihrem Tag am Strand suchen, suchen Sie nicht weiter, da wir ein kleines Dorf wie "Times Square" bekannt. Ob Sommer oder Winter, Vögel aus ganz Nordamerika zu finden Oase entlang der Südwestküste von Florida. Bringen Sie Ihre Ruten und Rollen der berühmten freien Angelsteg oder einen Platz zu reservieren auf einer Angeltour zu tiefen Gewässern. The location of the condo afforded us a beautiful view of the gulf and breathtaking sunsets. The property was clean, well maintained and contained everything we needed for our vacation. The owners, Karen and Don, couldn’t have been more accommodating and there was a welcome note on the table when we arrived, which was a nice touch. They were immediately available to answer any questions we had and made us feel well taken care of. We enjoyed the restaurants that were right across the street but also enjoyed cooking in the well equipped kitchen. Thank you for making our stay so special. 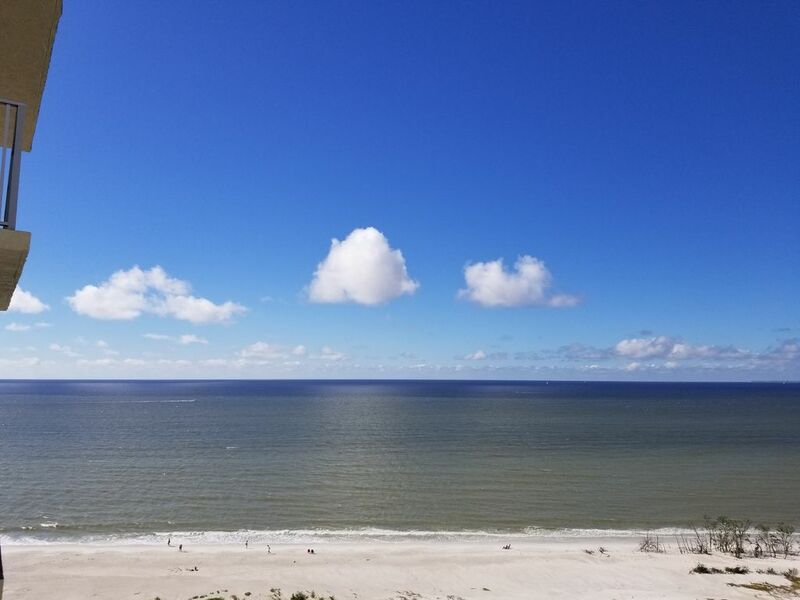 Outstanding panoramic views of the Florida Gulf Coast. Owners readily available to help make you have a pleasant and memorable vacation. We have been coming here for several years and each year there is something new and improved to this condo. A little piece of heaven here on Firt Myers Beach. We thoroughly enjoyed this clean, well equipped condo. The gulf views are fabulous. It is a quiet location, convenient to Santini and the trolley, with well manicured grounds and numerous outdoor lounge chairs. The owners were quickly accessible and responsive to questions. Very nice condo with a gorgeous view! This condo was very nice. It had most everything that we needed, including beach chairs and beach/pool towels. The bed was comfortable and the decor was very “beachy” which was so cute. The view was amazing, especially at sunset. We could even see dolphins from the balcony. The keyless entry was also very convenient. There were several very good restaurants and shopping within walking distance with a farmer’s market right across the street every Tuesday and Thursday. The only negatives are the TV, which had a dark shadow on the screen and also the clock by the bed did not work. Other than that, it was a wonderful 10 days! Thank you for sharing your thoughts and choosing us for your vacation.New TV and alarm clock purchased. This condo had absolutely everything to offer for a relaxing vacation. Property is well cared for, pool is sparkling clean, parking close to the building, and just a few steps to white sandy beach. Inside the condo I felt instantly at home and relaxed. Well-stocked kitchen, comfortable furniture, king size bed, and a huge shower. Large and private balcony with stunning views of the Gulf, miles of beach, and all kinds of wildlife to watch. Shopping and restaurants a short walk across the street and within a 5 minute drive for groceries. Perfect location! We enjoyed having you as our guest. We look f ok reward to seeing you again, soon. The Ultimate Thanksgiving meal on 12* Floor of Ostendorf's beautiful Lania, 2018. WOW !!! Wi-Fi outstanding. Inquiring, immediate response. Perfect Beach stretch view. 5 min walk to Santini Plaza. Beautiful sunset. Spotless, Very clean. Property well maintained. No birds on Lania. No maids to bother you. 520sq ft. plenty of room to relax. Keyless entry. Nice price, I'd stay again. Up high no obstruction from next condo. Quiet, no loud neighbors. Bathrooms near pool, keycard entry. White fluffy powder sandy beach. Well stocked kitchen. Dolphins most mornings playing. Trolley to uptown 75 cents is nice sightseeing. 4 bar/restaurants 5 min away. Nice Pool. 2 Elevators no stalling. Sleep on couch or bed, both very relaxing. Relaxing beach chairs w/umbrella, small soda cooler. I would recommend this to all my friends, the " Beach Combers Delight " ROCKYS !!! Thank you Karen & Don, Have a Merry Christmas & Happy New Year ! Fort Myers Beach: Willkommen auf den schönen Barriereinseln Fort Myers Beach - Estero Island und San Carlos Island - auf denen fast jeden Tag die Sonne scheint und die Durchschnittstemperatur 74 Grad beträgt. Strände sind wahrscheinlich die Attraktion Nr. 1. Rates are subject to change until reservation is confirmed.Rates vary by season. Written cancellation of a rental is required at least 60 days prior to arrival to receive a refund.